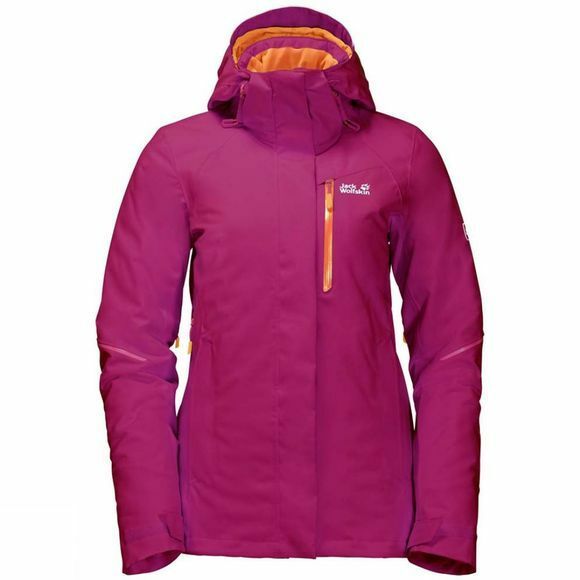 The Womens ExoLight Icy Jacket from Jack Wolfskin is a High-end Winter sports Jacket, the icy cold temperatures on the summit or the Wind on the ridge won't cramp your style. That's because it features our Microguard Maxloft Q.M.C. synthetic fibre Insulation. This Innovative material Insulates extremely well, and it's exceptionally Light and Highly breathable–the perfect mix for action-packed days on the snow.The Texapore O2+ SNOW fabric gives you best-In-class protection from the EleMents. We developed this robust hardShell fabric specifically for action sports. It has multi-directional Stretch properties and a pleasantly soft feel.It can get pretty warm skInnIng up the Hill or on gnarly descents, so we've used Nanuk AIR LOCK on the back of the Jacket. This fabric combines very good heat retention with superior air permeability. So the Jacket gives you the exactly right levels of Insulation and breathability exactly where you need them. The pit zips provide an additional ventIng option when you're on the move.And of course we've also Included a ski pass pocket, a snow skirt and a RECCO chip, plus special dockIng loops that allow you to connect the Jacket to the matchIng ski Pants.